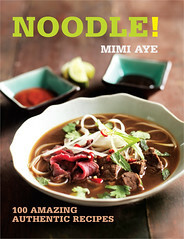 "Throw away your cookbooks - and please don't try this at home!" Confusingly commanding us to neither follow recipes nor copy his antics (what are we meant to do then? ), this week Heston Blumenthal visits the Tudor Era. The royal court of Henry VIII was flamboyant and spectacular - with Shakespeare wowing the crowds at the "the-AY-tre" (sic Heston), it was the 1st Golden Age of English cookery. Heston decides this is his opportunity to recapture lost greatness by making three dishes that would make Henry VIII "proud to be an Englishman". For once I like everyone in this picture. This week his guests are Sophie Ellis Bextor (Janet's little girl), the rambunctious Cavalier Jay Rayner, hotelier Ruth Watson (Channel 4 says she's off "Country House Rescue"), Kelvin MacKenzie (a journalist of some sort), and Ms Cillaaaaaaa Ber-lack! (sorry - was channelling Our Graham). Oh, and there's failed doctor Alex Zane. 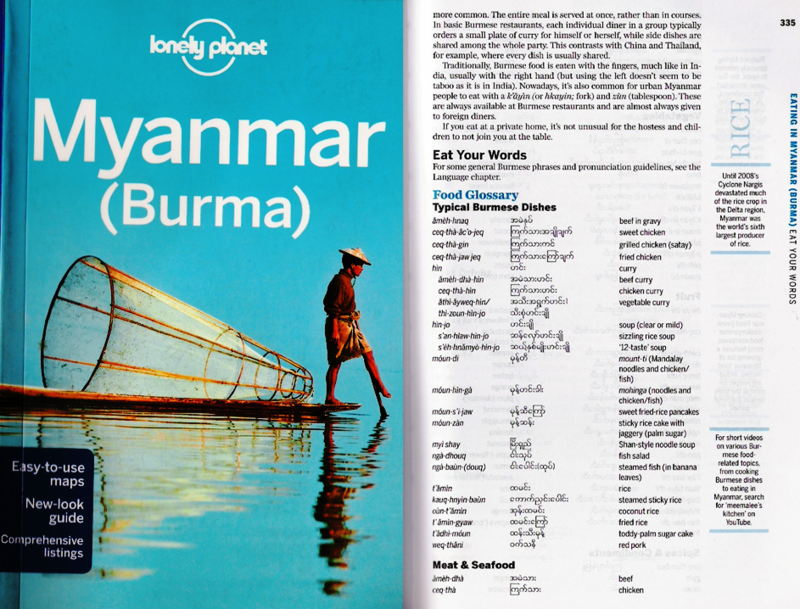 "His father currently resides in Trinidad, and has done some time. His mother lives in his native Leeds. Zane has mentioned on many occasions that while he was growing up, he, his mother and his brother lived in the upstairs of the house while their cats lived downstairs." 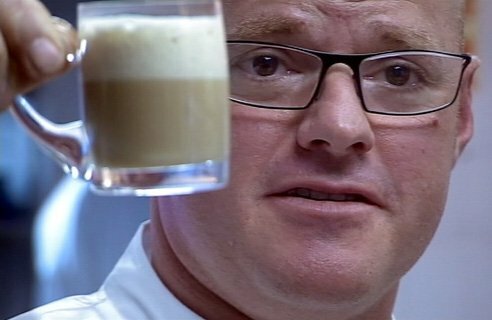 So Heston starts with an aperitif of Butterbeer which he refers to as "what wizards drink in Harry Potter", but which I know as "one of many things that JK Rowling ripped off from JRR Tolkien". It looks and tastes like eggnog and this simple (and dare I say it utterly boring) drink gets the thumbs from all but Kelvin who says "I dislike intensely the combination of alcohol and sweetness". Well, you're no fun at Christmas. Anyway, it turns out that Mr MacKenzie is the only food critic who hated the Fat Duck. Next Heston tells us that the Tudors played topsy-turvy with their food - beef and custard was an accepted combo, and meals would often start with chicken blancmange. Of course, the church banned meat for 70 or so days a year, so the Tudors stretched the definition of fish to include frog. In Heston's case, big motherloving, still-breathing frogs from New York's Chinatown. There chef Jo Ng decapitates, skins, boils, blends and strains the creatures to create a monstrous almondy smoothie. 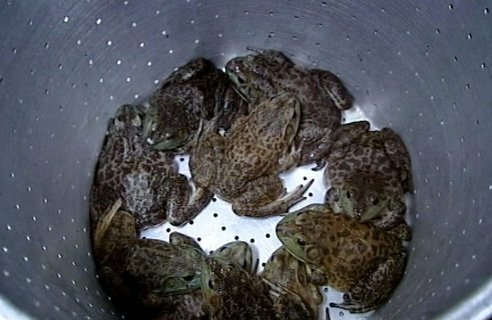 "What a waste of frog meat" says Heston, and having tasted Jo's battered frogs' legs, he also decides to make some froggy dippers. He experiments with tempura and then pané coating to create perfect KFC (that's Kermit Fried Chicken). To serve, he pours his frog stock blancmange into a water lily bowl perched on a lily pond nestling inside a hollow log, tops it with violets, rosewater and pomegranate and adds the frog leg dunkers. 'Tis a veritable hit with all except, yes, Kelvin who says "I preferred the plate". Now for the main. 80% of the food consumed in Tudor times was meat - Henry VIII held a £50,000,000 feast where they served 2000 sheep, 1000 chickens and 1 dolphin (only one, mind). 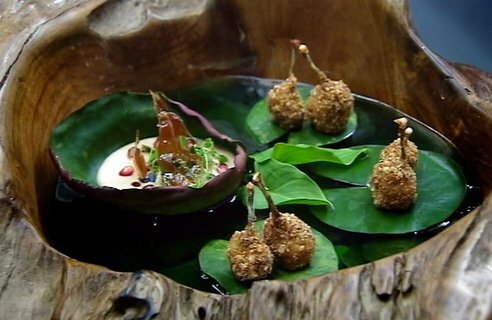 Heston wants to live up to this culinary bling by creating a Mythical Beast - another Tudor fancy where they served up various animals that had been bolted together. He finds a recipe in the Harleian Manuscripts (the TV shows me the Harleian Miscellany) to create a Cockentrice (but not Cockatrice) and manages to convince some plastic surgeons to help him in his bizarre foray into cryptozoology. The deed is done, and the pigtail is even re-attached to the chicken's bum by the smiling surgeon who I really feel should be correcting harelips somewhere else. Saying "I'm creating the freakiest dish in English history", Heston cradles the deviant creature and gets his local kebab shop to spitroast it (his local kebab shop appears to reside in the lobby of Fawlty Towers). As it turns, looking more monstrous than any elephant leg, the pride of England asks "Is it alive?" Though it tastes great and looks magnificent, Heston is disappointed - he wants to create "the daddy of all meat monsters". His team fry up some python, crocodile, kangaroo and zebra. Heston's never tried zebra before - in your face, Heston! Sadly, they decide this animal jigsaw's too chewy and Heston says "There's a reason why we don't eat this type of meat here" (that reason being you don't know how to cook it, unlike some people). 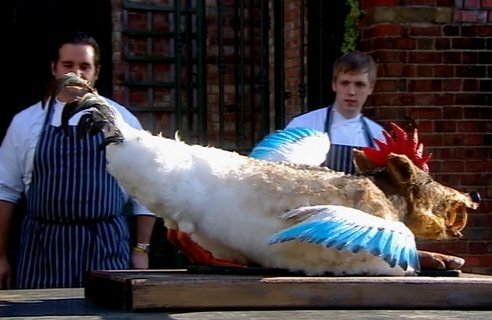 Finally Heston decides a monstrous, feathery, furry façade stuffed with traditional meats will fit the bill best. He visits Sylar's daddy and commissions a beast with a boar's head, a giant coxcomb, a lamb's torso and the legs and back end of a goose. 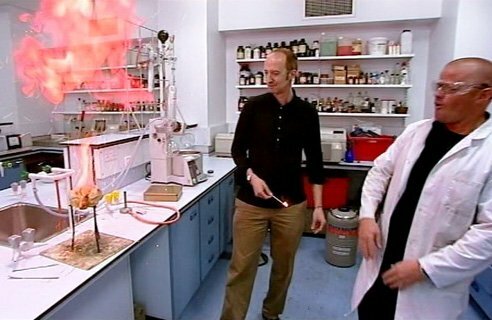 Then he goes to see UCL's Dr Andrea Sella who makes him "funny cotton" - cellulose soaked in nitric acid that goes up in a WHOOOMPH! when ignited. This he uses to clothe the beast in "fur" as the Tudors adored pyrotechnics (Shakespeare used them in the "the-AY-tre" you know). Grond at the siege of Minas Tirith. The maitre d' removes the insides, claims it's "Cockentrice meat" to the wary diners (it looks like cotechino) and serves slices with lamb jelly and wilted spinach. They love it - this time even Mackenzie's impressed. How will Heston top this - and how will his harshest critic react to a pudding that's not a pudding? Tudor puddings were a mix of sweet and savoury cooked in intestines - think black pudding and white pudding. Heston goes to the land of Ambrosia (not Heaven, but Devon) to try their rice pudding and to test his on the factory staff. I throw up a little when he indeed uses condoms to shape his rice pudding wieners. And of course now they look like real sausages, so he decides to caramelise them and serve them with banana and apple mash, and fennel and syrup gravy. He finishes off with some frozen peas aka sweet pea Dippin' Dots (old faithful liquid nitrogen). Meat and two veg ... or IS it? The Verdict? Cilla thinks it's fabulous, Kelvin MacKenzie suggests that people should always start with dessert, Alex Zane mocks him for his about face. As Zane puts it, they've all gone "food mad". Next week, the Romans - I'm expecting dormice. All photos belong to Channel 4! It makes fascinating telly, but I am a little disturbed with the way Heston's eccentricities are so willingly indulged. My mum always told me not to play with my food. He seems like a little boy who doesn't know when to stop. Brilliant post ... summed up the utter bonkersness of what is Heston's Feasts brilliantly! I think you should have raved against the Frog Murder! @Anonymous - yeah, it was grosser than anything else, wasn't it? Thihs sis the greatest blog ever. Keep iy up.